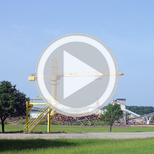 The Natchitoches Parish Port owns almost 700 acres, over 400 of which remains to be developed. The oxbow on which the port is located has a capacity to stage 20 - 30 barges. 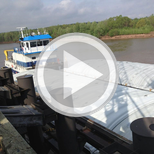 Corps of Engineers maintains a 9-foot by 200-foot navigation channel on the Red River. Lock chambers have dimensions of 84' x 705' which will accommodate a six-barge tow. Water transportation is one-third the cost of rail and one-fifth the cost of trucking. The Port has over 5 miles of track within its complex and is served by the Kansas City Southern Railroad. The Port is located on U.S. Highways 71 and 84, Louisiana Highways 6 and 486 and is only 10 miles from I-49. Over the past five years total tonnage handled through the port has averaged over 540,000 tons; average barge tonnage for the same time frame has been almost 120,000 tons.